As newspapers, magazines and countless websites spend a lot of time this month discussing the high and low points of this Fall TV season, I wonder if there was this much speculative criticism forty years ago. I’m particularly curious as to the nature of the buzz surrounding Anna and the King, a curiosity of a series that ran for 13 episodes in the fall of 1972. The pilot episode, with an optional commentary from its Anna, Samantha Eggars, is included as a bonus feature on the blu ray of The King and I. The series is most notable for starring Yul Brynner as the King (before he began the return Broadway engagements and tours that would occupy the last decade of his life). In her commentary Eggars says Brynner’s salary was record breaking at the time and that he had approval or authority over much of the production. 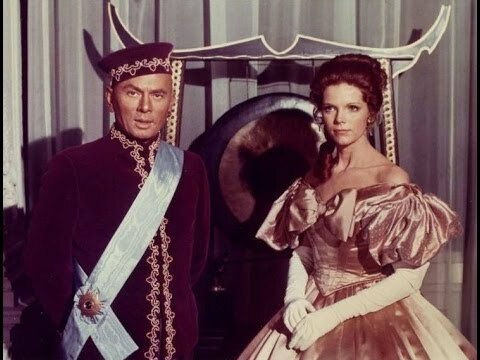 With Brynner’s influence, 20th Century Fox found sets and costumes from their films The King and I and Anna and the King of Siam (Eggars’ costumes are particularly recognizable from their previous lives). In fact, according to Eggars, the only matter in which Brynner did not get his was was on the issue of music–any semblance of Rodgers and Hammerstein’s score was strictly forbidden. (The being said, the series features some lovely underscoring, particularly in its equivalent of “The March of the Siamese Children”, which is staged almost exactly as in in the musical.) Eggars also spends much of the commentary praising Brynner’s talkent, charisma and presence, and recounts an anecdotes from a previous collaboration with Brynner that saw Eggars and Brynner socializing with Salvadore Dali (“Because Yul, of course, knows everybody”). Eggars expresses the belief that the series failed because it was out of sync with the times–a light fantasy in an era where TV audiences wanted darker realism. But she doesn’t take into account that The Waltons was beginning its second highly successful season as a homey, historical hit, and Little House on the Prairie would prove similarly successful two seasons later. Though far from being a “lost gem, the series is not quite as bad as I was expecting (if its use of a laugh track is pretty dreadful). The pilot closely follows some familiar events from the property’s various permutations: Anna’s arrival in Siam by boat, her disagreement with the King over her housing arrangements, and the scramble to prepare an elegant dinner party for the visiting British ambassador. The writing is vastly inferior to that found in the films, but Brynner and Eggars sell it reasonably well, and the production values are impressive. One could imagine how subsequent episodes would play out with material not so beholden to the original source. After all the contentious/affectionate, will they/wont they dichotomy of the title characters is the bedrock of must of today’s TV, and the numerous children could inspire any number of subplots. (One could say the same about the King’s many wives, though the kid angle was understandably highlighted while the polygamy was downplayed). Apparently later episodes did take such liberties with the characters and their situations, so much so that Margaret Landon sued (unsuccessfully) for copyright infringement, citing “inaccurate and mutilated portrayals”. Landon’s response was perhaps extreme–the series feels more like a copy of a copy of a copy than an outright bastardization. On the other hand, her book received so many first class adaptations that this decidedly second-rate interpretation is singular in its ineptitude. But if a better TV series could be made from the source material, but I doubt it would feel any more necessary. That being said, Brynner’s performance coupled with the fine production values (and the novelty factor) make me wish the remaining twelve episodes were available. Great review! As I collector of all adaptations of the story, I am looking for the series myself, could you help me find it?